Security forces block a road at the site of a suicide bomb attack in Kabul, Afghanistan, Nov. 28, 2018. Afghan officials said a suicide bomber detonated a vehicle-borne bomb Wednesday evening outside a British security company's compound in Kabul, making way for a group of armed assailants to storm the facility and spark fierce gunbattles. Afghan Interior Ministry spokesman Najib Danish confirmed the raid on the high-security facility housing the G4S security group. He said at least 10 people had been killed and that rescue workers had moved more than a dozen injured people to a local hospital. He did not discuss the number of assailants. The British company is said to be training Afghan police and providing guards for the British Embassy. The Taliban claimed credit for plotting the bomb-and-gun assault against the robustly fortified compound along a main road in Kabul. The main spokesman of the insurgent group, Zabihullah Mujahid, said the attack began with "a truck bomb." He said the powerful blast "removed all obstacles and cleared the way for multiple" Taliban suicide attackers to enter the base and engage "the enemy." Mujahid claimed Taliban attackers inflicted heavy casualties and said the violence was a reaction to civilian casualties caused by foreign forces in the southern Afghan provinces of Kandahar and Helmand. Earlier in the day, Afghan officials and residents said clashes in Helmand province between the Taliban and government forces backed by foreign airstrikes killed at least 30 civilians and 16 insurgents. Women and children were reportedly among the civilian casualties. The evening insurgent attack in Kabul came hours after President Ashraf Ghani, speaking in Geneva to an international conference on Afghanistan, announced that he had formed a 12-member team for prospective peace negotiations with the Taliban. Taliban spokesman Mujahid rejected Ghani's assertions, however, that the insurgents were ready to talk to his government. In a statement issued late Wednesday, Mujahid reiterated that the United States, not the Afghan government, had the authority to negotiate the fate of the war. He said the Taliban were fighting the U.S. for starting the conflict and were negotiating a settlement to the conflict with the U.S. because engaging in a peace process with the "puppet" Kabul regime would be "a waste of time." Afghan President Ashraf Ghani speaks during the U.N. Conference on Afghanistan in Geneva, Switzerland, Nov. 28, 2018. Ghani told the conference in Geneva that his government had formulated "a road map" for peace negotiations with the Taliban. "We have formed our 12-person negotiation team comprised of both women and men and led by presidential chief of staff [Abdul Salam] Rahimi. 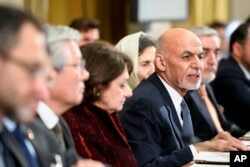 We have also formed a peace advisory board to [provide] input into the negotiations as they happen," Ghani said. The Afghan president spoke days after U.S. Special Representative for Afghanistan Zalmay Khalilzad held a second round of talks with Taliban negotiators, who are based in Qatar. Khalilzad launched his mission in September, calling on Ghani's government and the Taliban to appoint their "authoritative negotiating teams." Taliban officials insist on securing withdrawal of all U.S. and NATO forces from the country in "preliminary" talks with Khalilzad before they will participate in an intra-Afghan peace process. On Tuesday, a roadside bomb planted by the Taliban killed three U.S. soldiers and wounded three others, along with an American contractor, near the troubled central eastern city of Ghazni. The U.S. military has lost 11 personnel in combat action in Afghanistan this year. Afghan security forces also have suffered unprecedented casualties in recent years, losing nearly 29,000 personnel since 2015. Afghan civilians, meanwhile, continue to bear the brunt of the deadly conflict amid U.N. warnings that civilian casualties have reached new highs.